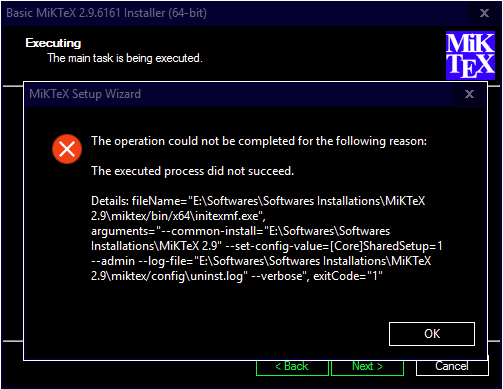 I'm a newbie in the whole TeX-&-LaTeX-based world, and I'm trying to install MiKTeX right now. My OS is Windows 10 Pro, 64-bit. I had MiKTeX, LaTeX, and LyX previously installed. I uninstalled them via the Change or Remove a Program of Windows. I repeated this process about 2-3 times, and in all of them, I had all the folders of MiKTeX, from what it seemed to me. And, And, in every single time, I got those errors. In the error message of the pop-up, it mentioned a log file. After I installed MiKTeX for the first 2-3 times, where everything seemed to be installed, I went to that log file, and it was empty. I don't know if the installation happened successfully in the previous times, since I got the same errors every single time, but now, I'm sure that it didn't. As opposed, like I said, to all of the folders that were installed, that seemed to be like they are all of what should be after a successful installation - folders like pdflatex and others. 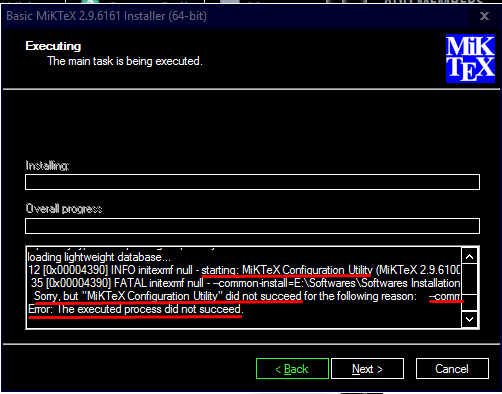 Browse other questions tagged errors miktex installing or ask your own question.